Please note that the content of this book primarily consists of articles available from Wikipedia or other free sources online. 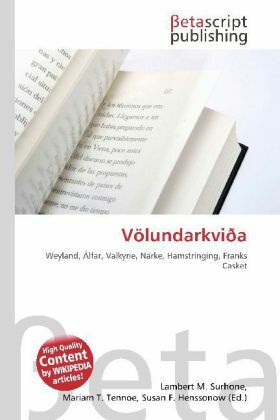 Völundarkviða (Völundr''s poem, the name can be anglicized as Völundarkvitha, Völundarkvidha, Völundarkvida, Volundarkvitha, Volundarkvidha or Volundarkvida) is one of the mythological poems of the Poetic Edda. The term kviða derives from the verb kveða (or kv tha in old Swedish) which carried the sense of "to say, to tell" and "to sing" at the same time.The poem relates the story of the artisan Völundr the Smith. In the poem, he is called "prince of the elves" (vísi álfa) and "one of the álfar" or "leader of álfar" (álfa ljóði). He is also mentioned as one of the three sons of the king of the Finns in the poem.